I've been away, I apologize. I've been baking (more later), and Monster Gramma has been canning. We're cooking our own dinners mostly and things are pretty mellow here at Casa de Batata. Spring has finally shown up and our gardens are in. This has proven more difficult than last year as the Winter That Wouldn't End kept me from preparing the ground and getting plants in said ground. Another part of the failure to get growing was a failure of our attempt to start plants from seeds. I'm not sure what we did wrong, but evidence points to the wrong starter medium. The plants got a great start, but became really leggy. More investigation is needed. In the mean time, the opportunity presented itself for a bit of self-guided foraging. Upon reading The Omnivore's Dilemma by Michael Pollan, wild foods came to my attention. 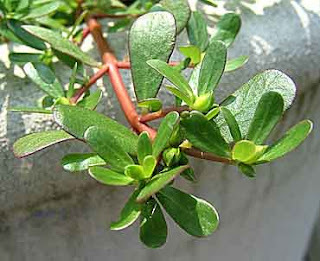 He specifically mentions Lamb's Quarters and Purslane as nutrient-rich and easily obtainable. When I decided to work some of my considerable Google-Fu on the plants mentioned, I was astonished that not only did I recognize them as a gardener, but I had been throwing them out without even so much as a second thought! Both plants are easily recognizable and you'd probably remember them from your last weeding session. Both show up later in the season, but show up they will. In my garden I have a sort of "dead spot" where all manner of greenery shows up and I'll make damn sure that I don't discard these extremely nutritious plants in the future. Since I've been awakened to the usefulness of "weeds," we've purchased a couple of plant identification books and one on foraging for wild greens called Edible Wild Greens by John Kallas. This brought a new collection of plants to my attention, especially dandelions, garlic mustard and field mustard. I have a dog and we will go to a "dog park" by the Minneapolis airport a couple of times a week. Sheila is 13 and not really interested in running much now a days, so I get a chance to examine the flora as she wanders from squat to squat. In my travels around the park, I've noticed all manner of edible plants: dandelions, wild onions, garlic mustard, shepherd's purse, and raspberries to list the ones my novice eye can recognize. 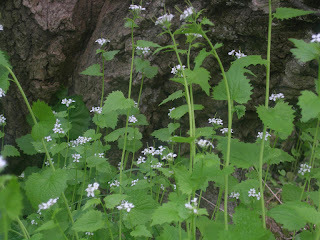 Today, I wandered into my favorite patch of garlic mustard. I found it over a month ago and I've been harvesting young greens from it since (it makes a wonderful green to go with scrambled eggs). Now that the temperatures have finally reached into the 70's, it has begun to bolt (grow a flower stem) and flower and it has quadruped in size since I've first spotted and harvested it. 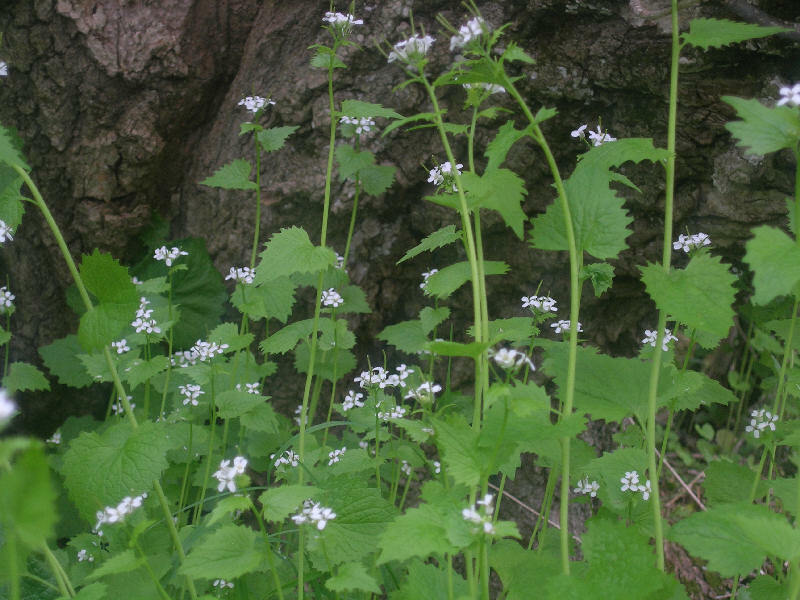 Garlic mustard is interesting in that it is first and foremost considered a noxious weed; it emits a toxin from its roots to stop other plants from growing near it. Its copious seed production can create patches that overtake native species and drive out local flora and the fauna that feeds on it, so eating it will help stop its spread, give you a tasty and easily obtained vegetable, and provide you with a tremendous burst of fibre, vitamins, minerals, and antioxidants. You can find it quite easily and if you crush one of its heart-shaped leaves (as it probably is now at this time of the year), you'll smell the garlicy odor that give this plant its name. It has a slightly bitter, peppery, and garlicy taste that I find pleasant, but others may find a bit strong. Boiling or sauteeing this plant will reduce any of the strong flavors. I like adding the leaves to regular salad greens to add a little punch. You can also try making what I had for dinner tonight: garlic mustard pesto. This is different from your typical pesto in that it doesn't have any real garlic and that it has an almost "fresh-cut grass" nose and taste. This is particularly tasty with a hearty whole-wheat pasta. It also freezes well, so if you find a healthy patch, dig 'em up and make a big batch. Put the garlic mustard tops and leaves in a blender or food processor along with the cheese and pulse until the garlic mustard has been chopped fine. Add the nuts and process until the nuts have been chopped fine and then begin processing the mix by continuously running the machine and gently adding oil until the desired consistency. 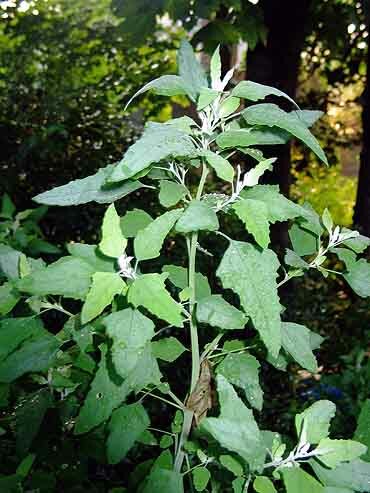 If you wish to back off on the oil, plan on adding more garlic mustard leaves and/or stems and flowers to add liquid. I really liked ur blog! Read the same book and it gave me a few second thoughts on what I'm eating. Interesting take on the "weeds"!